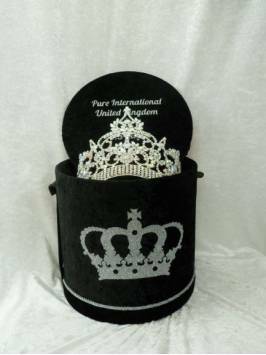 Bespoke crown boxes, sashes, sash bags, shoe bags, dress bags, t-shirts, pajamas, robes also available. Pageant Attire There are 12 products. 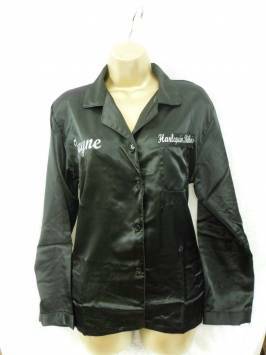 Black Satin Personalized Pyjama's. Long sleeved top and full length bottoms with elasticated waist. 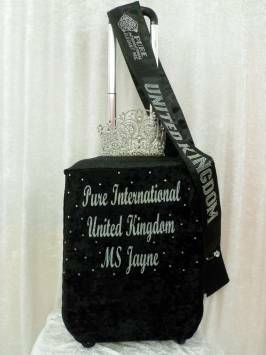 Small: Bust: 38" Inside Leg: 27" Medium: Bust: 40" Inside Leg: 28" Large: Bust: 42" Inside Leg: 29"
A Sash Purse keeps your sash secure and safe. Stud fastening and soft foam covered in crushed velour. Crystals if desired. 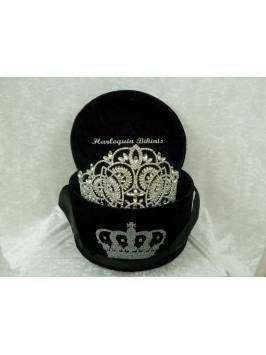 Other colours available, just ask, everything in the pageant attire is made to match. Crushed Velour Shoe Bag to fit any shoes in or out of a shoe box, drawstring to fasten and crystals can be added if desired. Navy blue bra style bikini decorated in Swarovski AB crystals - For bra style bikinis we do ask our ladies to post us a well fitted sturdy bra that we will then cover in the fabric of your choice. Decorated in 14 shapes and 4 gross of AB. Fruit of the loom t-shirts in various sizes, V neck and round neck. Please ask us for details Small: Bust: 32" Medium: Bust: 35" Large: Bust: 38"
Printed Varsity Jacket, various colours ordered from our supplier and printed by ourselves in a range of coloured vinyls, ask us for details. Print on the back and front left side. Turquoise Suit with Crystals. The fabric is out of stock but this can be made in any fabric with any crystal design.